"I get about 2,000 lira for putting up one tent," he said, using the popular term here for Syrian pounds. "I can do three or four a day, so that is 8,000." That, he said, is just about enough to feed himself, his mother, and her newborn baby twice a day. "But we can't eat all the time," he said. "My mother explained, we can't spend so much money on food because we need to buy stuff for the baby now." 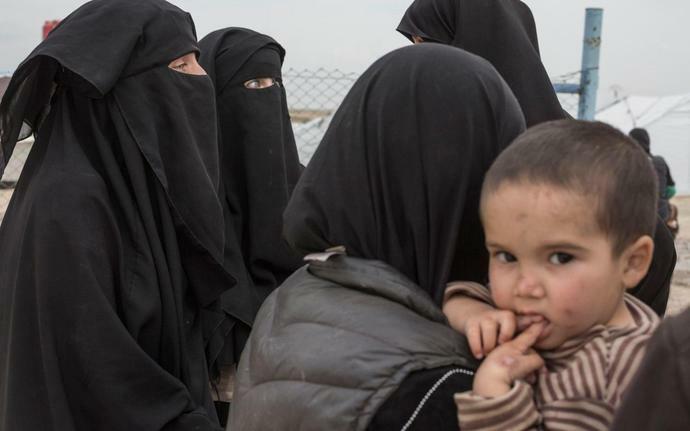 The Telegraph has seen dozens of malnourished infants as Isil families left Baghouz, Isil's last bastion, in the past two weeks. The casualties included Jarrah Begum, Shamima Begum's newborn son, who died of a lung infection last month. "If there was a school, I'd go to it," he said, as he took a pause in his tent work to speak to the Telegraph. "But there isn't one here." "When I was in Germany I was learning, then in Doula I learnt nothing," he said, using the Arabic word for "State" - the term many Isil families use for the group. "They just teach like the Quran... and they teach you that you have to fight. But I said: 'I don't want to fight'. I don't like to fight. I just want to be a normal one, I just want to live in a house and make my job. I don't want to fight, I don't want to be a warrior." The camp, he said, is a miserable and filthy place. "Kids poop everywhere," he said. "You have to watch where you walk. You can't just sit anywhere, like you can in Germany." "Play", if there is such a thing, involves picking on one another or chucking rocks at moving cars. "They call me a dog and things. They think it is a joke," said Hamed, when asked about his friends. "My mother doesn't like me to be like the other children. She says maybe there is a little baby there, like three years old, and maybe you'll hit him. Even though I don't like to throw rocks," he said. "It's not a game. They come, they throw, the glass breaks," he said. "In Germany it is not like this, you're not hitting on cars. If you want to play you go to your friends, you have friends, they don't call you anything, you play a bit." Adults here told the Telegraph that almost every child from about the age of eight upwards is a low-paid labourer in the camp's grey economy. "They're already entrepreneurs. I think they wake up and the first thing they think is: who am I going to hit up for money today?" said Lorna Henri, a 54-year-old woman from the Seychelles who has become the de-facto guardian of two unaccompanied children in the camp. "I try to give them what I can." Radical Isil supporters continue to exert influence inside al-Hol, including by harassing women who want to remove their veils. There have been reports of punishment tent-burnings by an underground "religious police", and several women from different countries who the Telegraph spoke to complained about being labelled "infidels" by their fellow inmates. The United Nations has expressed "alarm" at the situation. Last week Henrietta Fore, the executive director of UNICEF, urged member states "to take responsibility for children who are their citizens or born to their nationals, and to take measures to prevent children from becoming stateless." Jeremy Hunt, the Foreign Secretary, last week claimed that it would have been "too risky" to send British officials to save Jarrah Begum, although he remained a British citizen after his mother was stripped of her own citizenship.